What does GPL license means ? Who is using JPARSEC ? Page of my main project. A wiki page explaining in detail how to use the source code of JPARSEC is located here. LINUX Users: you will need the wget utility and at least java 1.5 installed in your system. Open a console, type the following two commands (or download the installation script http://conga.oan.es/~alonso/jparsec/installJPARSEC.sh), and then follow the instructions of the installer. If you get an error like java.lang.UnsupportedClassVersionError when typing the second command, that means you don't have java 1.5. Check the version with java -version. WINDOWS Users: download the previous file http://conga.oan.es/~alonso/jparsec/install.jar by hand and double clic on it (remember that java 1.5 is required). Please note that certain capabilities of the library are only available for Linux systems, and Windows is not supported. I can only say that it seems that most of the things work well in XP. The previous command will launch an installation assistant that will guide you in the process of installing everything. The only step that should be done carefully is the JRE (Java Runtime Environment) selection, that depends on the operating system. You can also install no JRE if you know what you are doing and you have a JRE 1.6 already installed in your system (you will have to adapt the script that launches the program to use the JRE in your system). After installing JPARSEC please read the Readme.txt file. The JRE distributed in the installer contains the Java3d libraries used in other tools, and in case you download both the Linux and Windows versions you can copy the installation directory to other operating systems and work on them. The only possible installation problem known comes when downloading some huge .jar files in systems with less than 1 GB of RAM. The solution, as explained in the manager help system, is to add '-Xmx100M -Xms100M' just after the command 'java' in the .sh or .bat files. This has already been done, but could fail in systems with less than 1 GB. The startup script for Windows is exec.bat (double clic on it to launch the program), and exec.sh for Linux users. In 64 bit systems you could have problems executing the main program in case you don't have the 32 bit compatibility libraries installed. One way to get them is to install a 32 bit version of a JVM (openJDK for instance) on that systems. MAC Users: It seems that everything works fine. First download http://conga.oan.es/~alonso/jparsec/install.jar by hand and execute the installer with java -jar install.jar. Select no JRE to install in the assistant and (after the installation) use the startup script for Mac systems. SEDFit: circumstellar disk (and envelope) fitting tool for continuum emission. It automatically downloads photometry from Vizier for a given source, allowing to add new photometry. Then the model parameters can be fitted by hand or using a script. DataCube: lmv (Gildas) cube analysis and modeling tool. Gildas cubes (from observations) can be loaded and then fitted using a radiative transfer model, either in LTE approximation or non-LTE (RADEX). Cubes can be rotated and cut in 3d. DiagRot: rotational diagram tool. It can create an arbitrary number of rotational diagrams that can (all at once) be exported to Gildas in an array of x-y charts. It is also possible to search in JPL and COLOGNE catalogs. 30mExplorer: an excellent tool to explore and automatically reduce 30m spectra. Latest version is fully functional. Compared to Gildas (Class), this tool is by far more flexible and fast. StatModel: a new tool to explore numerical data coming from the output of models. It is specially designed in this first version to explore a set of chemical models (included with the tool) to fit observational data to them. JPARSEC SlideShow: presentation tool for visualizing advanced presentations of scientific data. For my thesis mainly, and in my own opinion much better than PowerPoint or Latex for presentations in astronomy. First version is out and in production phase. Old program s5reloaded (still available) is outdated and I don't use it anymore, although it may be useful to export S5 Reloaded presentations to PDF. Fig. 1: Screenshots of some of the JPARSEC programs. Fig. 1: Screenshot of the new tool StatModel. Astrophotography tool and planetarium program (ClearSKY). It will rock, but only if I have enough time. Maybe this year? Fig. 3: ClearSKY (more exactly, the applet at the projects page) showing stars up to magnitude 16 in the globular cluster M13. ClearSKY application is currently in intense development status. It is currently possible to do astrophotography controlling mainly Canon cameras, and the program is designed to be controlled with a phone using a VNC client with the software itself running in a mini or stick PC. For an easy test of ClearSky it is possible to install a reduced version of JPARSEC and the manager to use only the ClearSKY program, maintaining all the features of the manager like automatic installation of updates. If you follow the development process and want to report some comments, they will be welcomed. Fig. 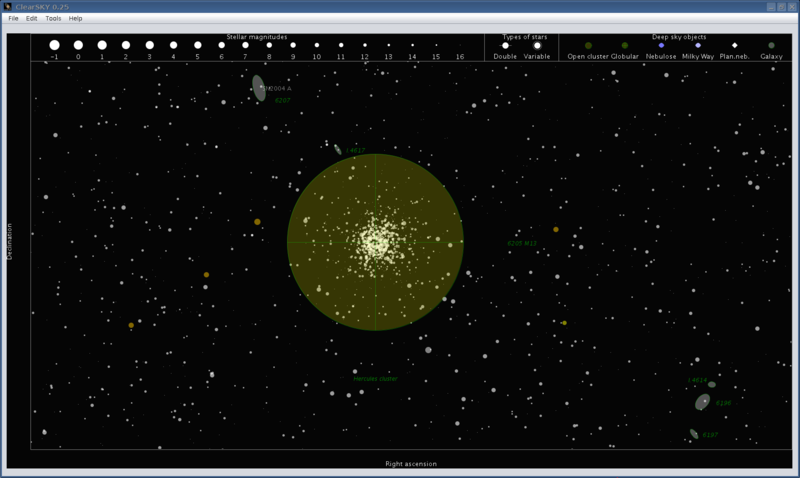 1: Screenshot of ClearSky showing in Spanish the astrophotography activity tool, instead of the planetarium activity. JPARSEC is a Java package of astronomical resources for standard ephemerides calculations. It is written in Java, which is by far the most advanced programming language in these years, and response to a demand in the astronomical community for a modern tool for astronomical ephemerides and model calculations. In this way, a great effort has been made to create the most powerful and modern tool for astronomical calculations, with maximum capabilities and accuracy. This tool is suitable for developing free software that requires maximum accuracy in ephemerides calculations, whether by using JPL DE4xx ephemeris or not. Applying astrophysical models, specially in the field of star formation and radioastronomy. Developing aplications that use Virtual Observatory tools. Developing astronomical almanacs and planetarium programs. See my web ephemerides server for an example. Planetary observations and many more. See the sky and solar system applet for an example. The main object of this package is to provide developers with an adequate library to create new astronomical applications. JPARSEC can also be used in it's own, even by people with a limited knowledge of Java, since only a few lines of code are required to test any of the features available. This package is the result of ten years of intense programming development (starting as a doctorate student), and it is based on more than 10 previous years of experience in the development of astronomical applications. Perhaps the best code and documentation ever made in an astronomical package. Elegant programming style, with a quality level similar to the most recognized companies. Plenty of comments, references, and explanations. Nothing is magically done. Very suitable for astronomical teaching, and optimized for a very easy usage. Support for most of the numerical integration or analytical theories made so far: JPL ephemerides (DE200/403/405/406/413/414/422/424/430), Moshier, VSOP87, ELP2000, Series96, the 2007 Martian satellites theory by Lainey et al., E2x3, E5, L1, Dourneau, TASS1.7, GUST86, … JPL DExxx ephemeris files are provided to cover the time span from 1900 to 2100, but are not required for high precision ephemerides. Ephemerides can be obtained for any object: planet, comet, asteroid, any natural or artificial satellite (including dwarf satellites), space probes (including hyperbolic orbits), trans-Neptunian objects, stars, … Full ephemeris includes physical ephemeris, orientation of the disk following IAU 2000/2006/2009 resolutions (independently), subsolar points, any rise/set/transit times (civil, or nautical/astronomical twilights), constellation, or charts numbers for several books. For natural satellites information is given about the current status (transits, shadows, eclipses, and so on), whatever the theory being used. Mutual satellites phenomena are also calculated, with an estimate of the occulted/eclipsed fraction and the effect in the apparent magnitude. IAU resolutions are supported, and results are available for any output equinox, any kind of coordinates (geometric, astrometric, apparent), any analytical theory, different frames (ICRF, mean dynamical, FK5, FK4). Reduction from rectangular coordinates can be performed in multiple ways, using (among others) IAU 1976, IAU 2000, and IAU 2006 resolutions (methods for precession, nutation, obliquity, and Greenwich mean sideral time). Reduction of coordinates fully updated, and JPL ephemerides available up to DE430, with a nominal accuracy in the output RA/DEC in the 0.1 milliarcsecond level (IAU 1976 set of reduction algorithms will match results from IMCCE server, and IAU 2006 ones those from Astronomical Almanac). Support for orbital elements from the Minor Planet Center, Celestrak, and also from the commercial program SkyMap. Orbital elements for planets available from the VSOP solution or calculable for any theory solving the two body problem from a position and velocity vector. The user can easily port the format of orbital elements from any other program. Any call to an ephemeris method has the same input/output parameters for an easy use or input change. Common input parameters are an EphemerisElement object (ephemeris properties), and ObserverElement object (observer position and atmospheric conditions, from a built-in database of more than 4000 cities or 1200 observatories), and a TimeElement object (calculation time, which can be set either in local time, universal time (UT1 or UTC), terrestrial time, and barycentric dynamical time). Calculation time can also be given in any calendar used or being in use. Compatible with Virtual Observatory protocols. Vizier catalogs, Simbad resolving, CDS, UCD, ADS abstracts, SDSS queries, among others, are fully supported. Plastic interface (to send or receive data and VO tables from other applications) was supported in previous versions, in case you need it in JPARSEC you can contact me. Very powerfull graphical capabilites, including, among other things, the best planetary rendering method freely available. Simultaneous sky and planetary renderings are supported, with large number of options and the possibility of showing stars up to 16th magnitude by means of internet queries to UCAC4 catalog (limiting magnitude of 10 without Internet connection), as well as the sky in anaglyph mode. Complex charts are supported through a very simple interface to JFreeChart, that allows to create sophisticate charts in a couple of lines of code. Charts can be exported to JPG, PNG, BMP, GIF, SVG, PDF, and EPS. At the same time, x-y scatter plots can be exported to GILDAS package, by means of an automatic script generation algorithm. GILDAS can also be controlled in background using pyGILDAS, allowing any user script to be executed from models. Contour charts in 2d can be created using SGT library. 3d charts are also supported with a similar interface to the libraries SurfacePlotter, VISAD, and JMathPlot. Accurate eclipse maps can also be rendered. Fig. 5: Triple eclipse on Jupiter, March 28, 2004, 08:02:30 UTC, rendered with JPARSEC (left) and observed by HST (right). Io and its shadow (center), Ganimede (right) and shadow (left edge), and Callisto's shadow (right edge). A lot of methods for coordinates transformations, for general astronomical calculations, and for input/output tasks with the data contained in catalogs and the results. Especially remarkable is the HTML and LATEX support, that allows to export query results or tables in these formats, or even to create pdf documents with easy. Available math operations include numerical integration, derivation, interpolation, and dynamical evaluation of expressions. A unit conversion utility is also available. Complex numbers and matrix operations (system solving) are supported. Astrophysical models available that can be used for scientific research. Among them an LTE/non-LTE gas radiative transfer model with 3d visualization of cubes, Kurucz 1992 LTE models for stellar atmospheres, a complete model for dust opacity based on Draine (using a Mie scattering code), or rotational diagrams. JPL and COLOGNE databases of molecular spectroscopy are integrated in the package, with no need of Internet connection to use them. The circumstellar disks model of Dullemond is also available, and is integrated with Virtual Observatory tools to provide an almost automatic SED fitting tool, taking the photometry automatically from Vizier catalogs and the stellar properties from Siess evolutionary tracks for pre-main sequence stars. A Java version of RADEX is also provided, including all the molecules/atoms currently available. Many more advanced operations very useful for developing applications, like a complete data model system that allows to perform error calculations by applying maths to physical measurements or unit transformations, technical calculations for single dishes (30m) and interferometers (PdBI), calculations with astronomical instruments (telescopes, oculars, CCDs), support to read and write spectra and cubes directly in the .30m, .lmv, and .fits formats (as an output from a model for example), advanced net functions (mails, ftp access, databases), or development of dialogs with advanced integrated functions in buttons or lists. Support for telescope control and data reduction. This includes the main Meade and Celestron models, as well as DLSR cameras. This feature is still incomplete, but telescope and camera control is currently functional. Ready for Android. A project called ClearSky is available in the Android Play Store. Automatic updates supported for any information used in the package that is subject to change: orbital elements of minor bodies, the list of observatories, Earth orientation parameters, solar spots database, and JPL and COLOGNE databases. It is written in Java JDK 1.6 (most features compatible with JDK 1.4), so it can be used in any Java-capable device. JPARSEC is distributed under GPL license, so it can only be used in a free software project (without asking me for permission). Latest source code for JPARSEC package is automatically downloaded when you install it using the instructions provided above. Source code is located at file jparsec.jar inside /lib subdirectory. It is a standard .zip compressed file. Source code for the tools created by means of JPARSEC library is provided in the .jar file of the corresponding tool, installed in the corresponding directory inside the main directory of the JPARSEC package. Anyway, you can always download the latest source code for JPARSEC library (the core of everything) in .zip format at http://conga.oan.es/~alonso/jparsec/lib/jparsec.jar. The javadoc documentation is available at http://conga.oan.es/~alonso/jparsec/doc.zip (and online at http://conga.oan.es/~alonso/jparsec/doc/index.html), and there are also some examples available to test the library at http://conga.oan.es/~alonso/jparsec/JPARSEC_examples.zip, but they will require to include some dependencies in the classpath to make them work. You can download those dependencies by hand at http://conga.oan.es/~alonso/jparsec/lib/, or just install the whole JPARSEC package following the instructions provided above. Some of these libraries are used unmodified, some were modified, and in others I just took some pieces of code. nom.tam.fits Tom McGlynn GNU ? (*) Library was modified to add additional features, source code is included in the .jar file. Current version of JPARSEC is 1.116, released on December 4, 2018. This release supports a new solar spots catalog (DPD) and SN catalog (OSC) to replace the previous catalogs (Greenwich and Padova) no longer updated. Detailed release notes are available at bitbucket and in class jparsec.util.Version. If you find JPARSEC useful and you decide to use it in your own project, feedback will be appreciated. To install JPARSEC source code in Eclipse you only have to create a new project and include as source the JPARSEC examples available at http://conga.oan.es/~alonso/jparsec/JPARSEC_examples.zip. To solve compilation problems download http://conga.oan.es/~alonso/jparsec/lib/jparsec.jar and the rest of .jar files available at http://conga.oan.es/~alonso/jparsec/lib/, and add them to the dependencies. It is easier to install the set of tools (see above) to automatically download all dependencies. Currently the only .jar file not installed with the set of tools is jpl_ephem.jar, although this file is only required for ephemerides of high accuracy. There are a few classes that will not compile, if you want to use them download also the file http://conga.oan.es/~alonso/jparsec/lib/otherDependencies.zip, uncompress it, and add the .jar files to the main library project (note the Jzy3d library requires JOGL with a correct configuration). The manager will remove every strange file not required for the models, so you must uncompress this file into another directory, not the /lib one inside the manager. The jparsec.jar file includes source code and javadoc, so you should have everything you need to start developing with JPARSEC. A detailed wiki page is available to help new users. JPARSEC is published on this repository at Bitbucket.org. You can use git and Maven to download, compile, or even contribute to JPARSEC. The code available there is more recent, although maybe less stable, than the official versions published in 3-4 months interval. Special thanks and credits for Carlo Dapor, without his help this would have never been possible. In case you use Maven to download all dependencies please take into account that some elements need to be touched to have everything ready to test the examples provided or the code snippets at the wiki page. In the jparsec lib directory you have libraries like jdom-1.0.jar (required to support JMathTex), a non standard (slightly touched) jfreechart/jcommon (required to support super/subscripts and other things in the labels of the charts), and among, others, series96.jar (required in some examples that use this specific theory for planetary ephemerides). JPARSEC also supports sky and planetary rendering on Android platform. A basic project for Android containing all required files is available at http://conga.oan.es/~alonso/jparsec/jparsecAndroid.zip. This project contains a reduced version of the library for Android, providing support only for ephemerides and sky/planetary renderings (using a reduced version of the set of planetary textures). The corresponding version of this library for Java desktop platform is provided at http://conga.oan.es/~alonso/jparsec/jparsecEphemOnly.zip. The only dependency for ephemerides is the file orbital_elements.jar (ephemerides for comets, asteroids, and artificial satellites). It is already included in the downloadable Android project, but should be updated twice a year from the link provided. For planets and satellites is not required. You can also test in your android device the basic application by installing the .apk package. The free Android project is a very old version of the final ClearSky planetarium for Android available at the ClearSky page at Google Play Store. NOTE: THE CODE OF THE CLASS AndroidGraphics IS NOT PROVIDED TO PREVENT THE QUICK RELEASE OF ANDROID APPS COPYING THE FEATURES OF CLEARSKY. YOU CAN WRITE YOUR OWN CLASS AND RELEASE A 0 COST APP FOR ANDROID, OR BUY A COMMERCIAL LICENSE. I was asked about the use of a GPL licensed software, like the JPARSEC library, in a commercial product. Here is my answer. My library is GPL code, and the use of GPL code in commercial applications or services is a complex matter. Strictly speaking, you can do it, but anything you do with GPL code must become also GPL code, with the same license, and must be freely available for downloading, as happens with my library. This means that in case you offer something that you think may worth some money (or not, it doesn't matter), me and anybody must be allowed to download/distribute your derived work for free, possibly offering later the same or better services with no restriction at all (even free of charge). i.e. you take something from the community and you also offer something that can be used freely. As you can imagine, to earn money in this way is very hard, but some companies succeed on this (for some time). This is why GPL code is (almost) always incompatible with commercial products. The only exception I would emphasize is the companies that offer support services for GPL software in the Linux operating system. To earn money you should develope your code from scratch, maintain your source closed (without distributing it, something not allowed in GPL'ed code), and show clients why what you offer is better than the software/services they can obtain from other competitors. As with GPL it is fine, moral, and legal, but also hard, in fact impossible if you can't develope competitive astronomical software. These general rules can have exceptions if I decide to give permission in a given situation, for instance in an interesting collaboration or in case just a very little part of my work is useful. For a more simple approach to ephemerides suitable for desktop, Android, and iOS projects (and released for commercial use) check my blog. Angelo Nicolini in his amazing Bungee Sky Atlas, probably the best free sky atlas ever made. Mark W. Powell, engineer at JPL has used JPARSEC to obtain ephemerides for the Sun as seen from Mars, to plan the scientific mission of the Curiosity rover on Mars. Read more here. Philip Giacalone is using JPARSEC in a control system for drones, apparently to identify celestial objects and separate them from other human-made flying devices. The piece of code for generating scientific labels and drawing Latex formula in a JFreeChart (among other graphic libraries) available here is licensed under LGPL (although in the code appears as GPL, I allow to use it in a potentially commercial project). It is being used by Francesca de Angeli in the Gaia project (for the common software package called GaiaTools), and some other people. Jan Kotek, developer of Asterope planetarium software. Joseph Novak has used JPARSEC for planetary rendering in his AstroClockFX tool. Jerome Courat, in his AstroJ tool for planning observations. Here is the provisional list of references (publications, books, web pages) used in the development of JPARSEC, ordered by themes, and inevitably incomplete. P. K. Seidelmann et al, Celestial Mechanics and Dynamical Astronomy 82, 83-111 (2002). Seidelmann et al. 2002, Report of the IAU/IAG Working Group on Cartographic Coordinates and Rotation Elements of the Planets and Satellites: 2000, Celestial Mechanics and Dynamical Astronomy, 82-1, pp. 83-110. G. H. Kaplan, “The IAU Resolutions on Astronomical Reference Systems, Time Scales, and Earth Rotation Models”, astro-ph/0602086 = USNO Circular 179 (2006). Hilton et al., Celest. Mech. 94, 351-367 (2006). Wallace and Capitaine, A&A 459, 981 (2006). Seidelmann et al. 2007, Report of the IAU/IAG Working Group on Cartographic Coordinates and Rotation Elements: 2006, Celestial Mechanics and Dynamical Astronomy, 98-3, pp. 155-180. Archinal et al. 2011, Report of the IAU Working Group on Cartographic Coordinates and Rotation Elements: 2009, Celestial Mechanics and Dynamical Astronomy, 109-2, pp. 101-135. Archinal et al. 2011, Celestial Mechanics and Dynamical Astronomy, 110-4, pp. 401-403. J. H. Lieske, T. Lederle, W. Fricke, and B. Morando, “Expressions for the Precession Quantities Based upon the IAU (1976) System of Astronomical Constants”, Astronomy and Astrophysics 58, 1-16 (1977). J. Laskar, “Secular terms of classical planetary theories using the results of general theory”, Astronomy and Astrophysics 157, 59070 (1986). J. G. Williams, “Contributions to the Earth's obliquity rate, precession, and nutation”, Astron. J. 108, 711-724 (1994). J. L. Simon, P. Bretagnon, J. Chapront, M. Chapront-Touze', G. Francou, and J. Laskar, “Numerical Expressions for precession formulae and mean elements for the Moon and the planets,” Astronomy and Astrophysics 282, 663-683 (1994). Capitaine et al., Astronomy and Astrophysics 400, 1145-1154, 2003. N. Capitaine et al., Astronomy and Astrophysics 412, 567-586, (2003). Vondrak et al. 2011. See A&A 534, A22. E. W. Woolard, “A redevelopment of the theory of nutation”, The Astronomical Journal 58, 1-3 (1953). P. K. Seidelmann, “1980 IAU Theory of Nutation - The final report of the IAU Working Group on Nutation”, Celestial Mechanics 27, 79-106 (1982). “Nutation and the Earth's Rotation”, I.A.U. Symposium No. 78, May, 1977, page 256. I.A.U., 1980. Murray, Monntly Notices Royal Astronomical Society 195, 639-648 (1981). Souchay, J., Loysel, B., Kinoshita, H., Folgueira, M., A&A Supp. Ser. 135, 111 (1999). P. T. Wallace, “Software for Implementing the IAU 2000 Resolutions”, in IERS Workshop 5.1 (2002). Chapront, J., Chapront-Touze, M. & Francou, G., A&A 387, 700 (2002). Moyer, T. D., Cel. Mech., 23, 33 (1981). Murray, C. A., Vectorial Astrometry, Adam Hilger (1983). F. R. Stephenson and L. V. Morrison, “Long-term changes in the rotation of the Earth: 700 B.C. to A.D. 1980,”, Philosophical Transactions of the Royal Society of London Series A 313, 47-70 (1984). Borkowski, K. M., “ELP2000-85 and the Dynamical Time - Universal Time relation,” Astronomy and Astrophysics 205, L8-L10 (1988). Fairhead, L., Bretagnon, P., A&A 229, 240-247 (1990). Seidelmann, P. K. et al., Explanatory Supplement to the Astronomical Almanac, Chapter 2, University Science Books (1992). McCarthy, D. D., IERS Conventions (1996), IERS Technical Note 21, Observatoire de Paris (1996). Chapront-Touze M., Chapront J., “The Lunar Ephemeris ELP 2000”, A&A 124, 50 (1983). J. Lieske, Astronomy & Astrophysics 176, 146-158 (1987). Laskar J., Jacobson, R., “GUST86 - An analytical ephemeris of the Uranian satellites”, A&A 188, 212-224 (1987). Chapront-Touze M., Chapront J., “ELP 2000-85: a semi-analytical lunar ephemeris adequate for historical times”, A&A 190, 342 (1988). Chapront-Touze M., “Orbits of the Martian satellites from ESAPHO and ESADEI theories”, A&A 240, 159-172 (1990). Jean Meeus, Astronomical Algorithms, 2nd Edition (1992). G. Dourneau, “Orbital elements of the eight major satellites of Saturn determined from a fit of their theories of motion to observations from 1886 to 1985”, A&A 267, 292 (1993). Vienne, A., Duriez, L., TASS 1.6 and 1.7, A&A 297, 588-605 (1995), and A&A 324, 366 (1997). J. Lieske, “Galilean Satellite Ephemerides E5”, A&A 129, 205-217 (1998). Lainey et al. Astronomy and Astrophysics 427, 371 (2004). Lainey V., Dehant V. and Paetzold M., “First numerical ephemerides of the Martian moons”, A&A 465 1075-1084 (2007). Pierre Bretagnon and Jean-Louis Simon, “Planetary Programs and Tables”, Willman-Bell, 1986. Bretagnon P., Francou G., Astron. Astrophys., 202, 309 (1988). J. Chapront, G. Francou, “Representation of planetary ephemerides by frequency analysis. Application to the five outer planets”, Astron. & Astrophys. Suppl. Ser. 109, 191 (1995). Standish E. M., Newhall X. X., Williams J. G., Folkner W. M., “JPL Planetary and Lunar Ephemerides DE403/LE403”, Interoffice Memorandum, IOM 314,10 - 127, Jet Propulsion Laboratory (1995). Standish E. M., “JPL Planetary and Lunar Ephemerides DE405/LE405”, Interoffice Memorandum 312F, 98 - 048”, Jet Propulsion Laboratory (1998). Standish E. M., “JPL Planetary Ephemerides DE414”, Interoffice Memorandum 343R, 06 - 002”, Jet Propulsion Laboratory (2006). Meeus's Astronomical Algorithms and Elements of solar eclipses 1951-2200. EmapWin Ver. 2.12 (2012.11.17), downloadable from http://www.kotenmon.com/cal/emapwin_eng.htm. Bessel paramaters used in JPARSEC kindly supplied by Shinobu Takesako, author of EmapWin. Johnson, H. L., ApJ 141, 923 (1953). C. F. Bohren, D. R. Huffman, Absorption and Scattering of Light by Small Particles, John Wiley & Sons, New York, 1983. Warren S. G., Applied Optics 23, 1206 (1984). Water optical properties improved in 1995 by Bo-Cai Gao, Steve Warren, and Warren Wiscombe. Draine & Lee, ApJ 285, 89 (1984). Cardelli, Clayton, Mathis, ApJ 345, 245 (1989). Draine, B. T., Malhotra, S., ApJ 414, 632 (1993). Chiang and Goldreich, ApJ 490, 368-376 (1997). Buser, R., Kurucz, R. L., A&A 264, 557-591 (1992). Preibisch et al., A&A279, 577 (1993). Laor, A., Draine, B. T., ApJ 402, 441 (1993). Natta et al., A&A 416, 179 (2000). Weingartner, J. C., Draine, B. T., ApJ 548, 296 (2001). Li, A., Draine, B. T., ApJ 554, 778 (2001). Dullemond, Dominik, and Natta, ApJ 560, 957-969 (2001). Seidelmann, P. K. , Kovalesky, J., A&A 392, 341-351 (2002). Chapront, Chapront-Touze and Francou, A&A 387, 700 (2002). M. Cohen et al, “Spectral Irradiance Calibration in the Infrared. XIV. The Absolute Calibration of 2MASS”, AJ 126, 1090 (2003). Hilton and Hohenkerk, A&A 413, 765-770 (2004). Draine, ApJ 636, 1114-1120 (2006). Van der Tak, F.F.S. et al., A&A 468, 627-635 (2007), RADEX software. Chapront et al. 1988, Williams et al. 2008, Seidelmann et al. 2007, Konopliv et al. 2001. Jia-Cheng Liu et al. 2010 (see http://arxiv.org/abs/1010.3773). Ruckdeschel, F. R., “Basic Scientific Subroutines”, Mc-Graw Hill 1982. Computation of Special Functions, by Shanjie Zhang and Jianming Jin. Roman, N. G., “Identification of a Constellation from a Position”, Pub. Astron. Soc. Pac. 99, 695, (1987). Danby, “The Solution of Kepler's Equation”, Celestial Mechanics 31, 95-107 (1983), and Celestial Mechanics 40, 303-312 (1987). Davenhall, A. C., Constellation Boundary Data, http://vizier.cfa.harvard.edu/viz-bin/ftp-index?VI/49, 1989. Montenbruck, O., “Practical Ephemeris Calculations”, 1989. P. Ramon Escobal, “Methods of Orbit Determination”, 1965. Java for Engineers and Scientists, S. J. Chapman. BSC5 Catalogue, 5th revised edition, Hoffleit et al. 1991. IRS Catalogue, Corbin et al. 1991. Seidelmann, P. K., The Explanatory Supplement to the Astronomical Almanac, 1992. Cohen, E. R., Taylor, B. N., “The Fundamental Physical Constants”, Physics Today, August 1997. Brad Schaefer, “To the Visual Limits”, Sky & Telescope, May 1998, 57-60. Dershowitz, N., Reingold, E. M., Calendrical Calculations. UCAC3 Catalog, Zacharias et al. 2009. FK6 Catalog, Wielen et al. 2000. Sky2000 Master Catalogue, version 5, Myers et al. 2006. See https://wakata.nascom.nasa.gov/dist/generalProducts/attitude/ATT_SKYMAP.html. Fourth Catalog of Orbits of Visual Binary Stars, Worley et al. 1983. Sixth Catalog of Orbits of Visual Binary Stars, Hartkopf et al. 2006 (http://ad.usno.navy.mil/wds/orb6/orb6orbits.txt). Morrison and Stephenson, “Historical values of the Earth's clock error dT and the calculation of eclipses”, JHA 35, 327 (2004). Fred Spenak, Jean Meeus, Five Millenium Canon of Solar Eclipses, NASA/TP-2006-214141. IAU SOFA (Standards Of Fundamental Astronomy), IAU SOFA Review Board (2005). NOVAS software package, v3.0, USNO (2006) (http://www.usno.navy.mil/USNO/astronomical-applications/software-products/novas). P. Thévenaz, T. Blu, M. Unser, “Interpolation Revisited,” IEEE Transactions on Medical Imaging, vol. 19, no. 7, pp. 739-758, July 2000. A. Muñoz Barrutia, T. Blu, M. Unser, “Least-Squares Image Resizing Using Finite Differences,” IEEE Transactions on Image Processing, vol. 10, no. 9, pp. 1365-1378, September 2001. Christian d'Heureuse, Base64 encoding/decoding, http://www.source-code.biz/base64coder/java/. Ben Clifford, writing roman numbers, http://www.hawaga.org.uk/java/benno/number/Roman.java. JPL (http://spec.jpl.nasa.gov/ftp/pub/catalog/), COLOGNE (http://www.astro.uni-koeln.de/site/vorhersagen/catalog/), and Splatalogue (http://splatalogue.net/) databases of molecular spectroscopy. KStars catalog of constellation lines for different cultures. Stellarium catalog of deeps sky images and their orientations. Java libraries jfreechart, astroRuntime, cds, sgt, freehep, jama, nom.tam.fits, astrolib, VISAD, jMathPlot, SkyView, jsch, javax.mail (comm), java3d, ditaa, jzy3d. FastMath library by Bill Rossi, integrated in Apache Commons Math. Pieces of code taken from contributions by Steve L. Moshier, Donald W. Denbo, Mark Huss, Bill Gray, Kerry Shetline, Joseph A. Huwaldt, Mark Hale, M. Thomas Flanagan, Vern Raben. Milky Way texture by Nick Risinger, http://apod.nasa.gov/apod/ap110519.html. Flower, P.J., Astrophys. J. 469, 355 (1996), Pickles (1998), Portinari 2005, Turner 2013. Catalogs: The 2MASS Point Source Catalogue, Cutri et al. 2003, MSX6C Infrared Point Source Catalog, Egan et al. 2003, Radio emission from stars at 250GHz, Altenhoff et al. 1994, Catalogue of stellar UV fluxes, Thompson et al. 1978, UBVRIJKLMNH Photoelectric Catalogue, Morel et al. 1978, The Tycho-2 main catalogue, Hog et al. 2000, Pre-main-sequence stars observed by IUE with LW cameras, Valenti et al. 2003, 1.4GHz NRAO VLA Sky Survey (NVSS), Condon et al. 1998, DENIS, Fouqué et al. 2000. Feel free to report here any bug, problem, or suggestion you could encounter when installing or using JPARSEC software. Send your messages to Tomás Alonso Albi.